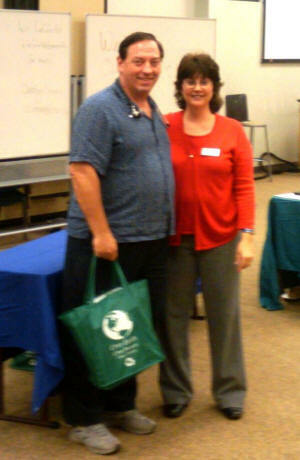 Michael begins work on his doctorate in naturopathic medicine. I've mentioned before that Michael intended to get his doctorate in Naturopathic Medicine. That's right…my husband, the doctor! This past Wednesday his classes started. The first three days consists more of orientation than anything else; and today, Friday, spouses were invited on campus to join in the celebration. I had to work in the morning but was able to join Michael in time for the Stethoscope Ceremony, in which Michael and his classmates were formally presented with his stethoscope, blood pressure monitor, and other essentials he'll be using in class for the next four years and, hopefully, for some years after that. The SCNM campus was not overcrowded and I had no problem parking in their lot. I was directed to the classroom in which the ceremony was to take place. I walked in and Michael gave me an empty seat between him and his classmate, Rory. The students (and their significant others) were being warned how very, very difficult the course of study was going to be, and that there was a support group for spouses to help us get through the incredibly difficult four years ahead of us. I have a feeling they need to start working with a new public relations firm. Then Dr. Joni Olehausen, N.D., the Dean of Medical Education, presided over the Bestowing of the Stethoscopes. There were only 30 or so students in the class so there was time for each student to be photographed with the Dean. I think someone was taking official photographs as well, which is good because I hadn't realized today would be a photo op and had to snap away with my cell phone. Michael was now, officially, a "candidate". Michael cannot call himself a student doctor until after he passes the clinical board exams in a couple of years. Rory didn't have any family present so I took a picture of him to and emailed it to him. After the ceremony, we headed out to the lovely garden area, a place filled with picnic tables set beneath shade tress and among various herbal plants. Sean Hesler, a 4th-year student doctor who I've seen a number of times at the SCNM clinic where I go for acupuncture, joined us—it was funny, actually; I had never seen him not wearing a tie and scrubs so he looked familiar but I couldn't place him right away. Sean is heavily involved in Naturopaths Without Borders, a group that visits third=world countries to provide naturopathic medicine to people who need it. Since naturopathic medicine relies on medicinal herbs that grow locally, access to this style of medicine can provide relief to people without money that conventional medicine, with its reliance on expensive pharmaceuticals, cannot. 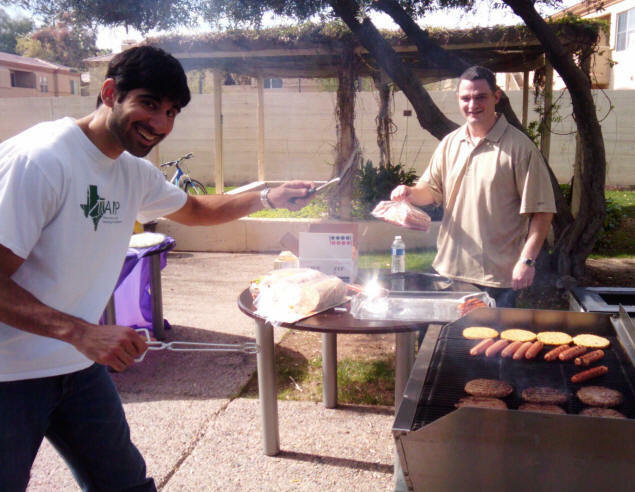 The student ambassador, Saman Rezaie, did the barbequing and soon the burgers and hot dogs—both in meat and vegetarian varieties—were ready. During lunch, I met more of Michael's classmates and their spouses. I met a woman from Bermuda and her husband from Chicago, but who had lived everywhere; a guy from New Orleans and a woman and her son who were from Iran but had most recently lived in Atlanta. Her son, whose nickname was Q, was 12 years old, about to receive his back belt in karate, and was very knowledgeable about the cities and countries of the world—far more than I had been at his age. He reminded me in some ways of a slightly older Zachary. In short, the class is quite and delightfully diverse. After lunch people people drifted away; we didn't need to meet again until 5:30. So Michael and I ran off to Fry's Electronics to price netbook computers; he'll need one for class. We found several for under $300; he'll be picking one up when his student loan funds are disbursed. At 5:30 we were back in the parking lot where we met Saman and about half Michael's classmates. We thought we were going to dinner, but Saman had other plans. We followed him to the nearest parking lot for the Valley Metro Light Rail, and took the train into downtown Phoenix, where a celebration called First Friday was in full swing. I've lived here since 1999 and I had never heard of this. It happens the first Friday of every month. A street is closed off to vehicular traffic and people walk along it, able to visit booths and open stores along the way selling everything from Pizza and T-shirts to anti-abortion propaganda and Scientology stress tests. Several bands were playing concurrently, at different locations, loud enough so that it was a challenge to pick just one to hear at a time. Before we went down that street, though, Saman led us to the Phoenix Art Museum—another place I'd never been (though Michael has been), Admission is free on First Friday. Saman turned us loose there for an hour-and-a-half of wandering among fine art. Michael and I particularly enjoyed the Ansel Adams exhibit of national park photos taken in the 1930s and '40s, but some of the more modern pieces, many of them large and three-dimensional, were very cool as well. After the museum, and the First Friday tour down the crowded street, Michael and I returned to the Metro for the return to our car, parked in Tempe. Then, because we were still hungry (the Polish Sausages bought from a street vendor hadn't quite done the trick), we stopped at Denny's for a late dinner. So, that was our Friday. I now know about First Friday and the Phoenix Art Museum, and Michael is on his way to becoming a doctor of naturopathic medicine. Woo-hoo!